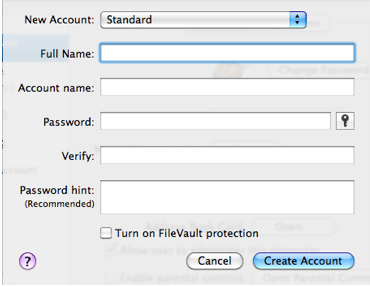 Mac OS X supports the creation of separate accounts for each person who uses the computer. 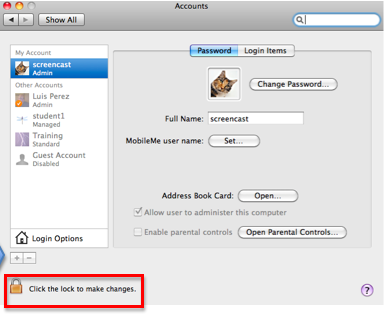 This makes it possible to set up each account with the accessibility settings that match each student’s need. 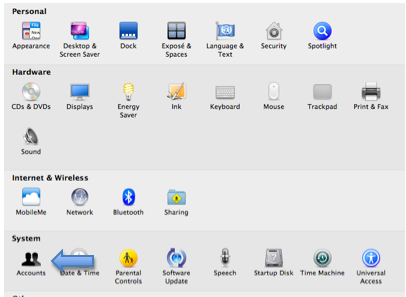 Choose Apple, System Preferences, Accounts. Click on the Lock icon at the bottom of the Accounts window and enter your administrator password for your computer. Click on the Plus button below the Accounts list on the left side of the Accounts window. Use the pulldown menu to choose an account type (Standard, Administrator, etc. ), then enter the information for the new account: the full name of the user, the preferred Account name and Password, and a password hint. Click on Create Account. The new account will be listed on the accounts list on the left side of the Accounts window.